There’s something brewing at Hammond Square—join us for a family-friendly Halloween scare! Stirling Properties and Hammond Square announce the 5th Annual Halloween at the Square event on Friday, October 12th from 5:30-7:30pm for children ages 12 and under. The spooktacular event is free and open to the public. Costumes are highly encouraged. 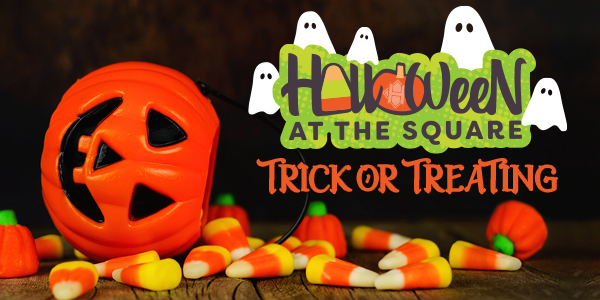 Kids are invited to trick-or-treat at Hammond Square’s participating stores that will be stocked with more than 25,000 pieces of candy and prizes throughout the evening! Just look for the Trick-or-Treat Station sign in store windows. Halloween at the Square is one of Hammond Square’s premier family-friendly community events of the year. It offers Hammond area residents a safe, convenient and fun trick-or-treating experience while providing increased foot traffic and exposure for the many great retail tenants at the shopping center. Throughout the evening, guests are invited to have free photographs taken with Becky Blount, Hammond Square’s Official Event Photographer. Hay bales and pumpkins will be on display for backdrops, and pictures will be made available on Hammond Square’s Facebook page within a few days of the event. There will also be a Halloween Costume Contest at East of Italy (for kids in costume 12 & under only). Stop by East of Italy during the event and enter to win a $100 e-gift card! Hammond Square is Tangipahoa Parish’s premier shopping destination, located on approximately 100 acres at the northwest corner of Interstate 12 and US Highway 51 Business (SW Railroad Avenue) in Hammond, Louisiana. It is the 2nd largest open-air center in Louisiana encompassing 902,000-square-feet of more than 40 national and local retailers, shops and restaurants, including Dillard’s, Target, The Home Depot, JCPenney, Academy Sports+Outdoors, AMC Theatres, and Old Navy (coming soon). Stirling Properties redeveloped Hammond Square and currently manages and leases the center. Connect with Hammond Square on the web at www.hammondsquare.com or “like” us on facebook.com/hammondsquare.